The Marquis of Wellesley was Governor General of India from 1798 to 1805; in 1803 he set up a committee for the improvement of Calcutta. One of its achievements was the construction of the Strand Road, which ran along the River Hooghly from Chandpal Ghat northwards. The artist, Sir Charles D'Oyly, arrived in India in 1797 and spent his first few years in Calcutta as Assistant to the Registrar of the Court of Appeal. He was also the Collector of Dacca and Opium Agent at Patna later in his career. D'Oyly was a prolific amateur artist who was greatly admired by the European community. 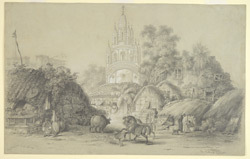 This view shows a temple in the background with several thatched huts, figures and horses in the foreground.